TypingTraining.com is an online typing tutor for both one handed and two handed typists. Special resources are included for anyone with the use of only one hand. TypingTraining.com will teach you (or your students) how to type effectively with one hand on a standard keyboard. 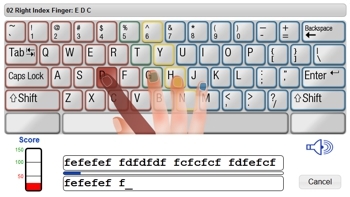 Learning how to type on a standard keyboard allows you to use any computer, anywhere, without needing specialized equipment. Our Hand Function approach to training recognizes that we have greater control over our index and middle finger than we do over our ring and little finger. Specialized activities focus on each finger individually, allowing anyone to learn the finger motions as efficiently as possible. Rhythmic auditory feedback during lessons provides helpful reinforcement, while aiding in the development of muscle memory. Clear, bold, easy-to-read graphics demonstrate proper technique. Feedback is provided to show areas of strength and weakness. TypingTraining.com is a web-based typing course, so you can get started immediately. There is no software to install. Setting up an account for one-handed typing is as easy as changing a setting. Visit our home page to learn more or sign up for a free trial.